Vocational Teacher & District Consultant Vacancies in Rashtriya Madhyamik Siksha Abhijan (RMSA), Assam. - Jobs4NE : Jobs in Assam and North East India. 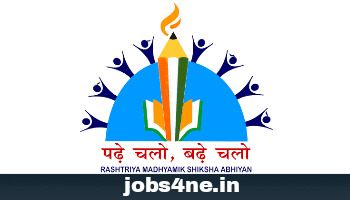 Vocational Teacher & District Consultant Vacancies in Rashtriya Madhyamik Siksha Abhijan (RMSA), Assam. A walk in interview in the State Mission Office of Rashtriya Madhyamik Siksha Abhijan (RMSA), Assam is to be conducted for the position of “Vocational Teacher (IT)”, “Vocational Teacher(Retail)” under NSQF Scheme of RMSA, Assam and “District Consultant” in District Mission Office, RMSA, Assam for the following vacancies. Date & Time of Interview: 28-06-2017, 11 A.M onwards. For Vocational Teacher: 29-06-2017, 11 A.M onwards. For District Consultant: 30-06-2017, 11 A.M onwards. Place of Interview: State Mission Office RMSA, Assam, Kahilipara, Guwahati. Total no. of post: 05 Nos. 1. Vocational Teacher: 3 Nos. Qualification: BCA/ B.Sc (Computer Science)/ B.Sc (IT) from any UGC recognized University OR 3 years Diploma in Computer Science/ Engineering or IT/ITES or DOEACC A level. 2. Vocational Teacher (Retail): 1 No. Qualification: Graduate or Diploma in Retail Management, P.G. Diploma in Marketing with at least 50% marks and 1 year experience. Preference will be given to higher education with MBA (Retail Marketing) and PG Diploma in Retail Management. 3. District Consultant: 1 No. Qualification: Candidates with minimum 60% marks in Post Graduate Degree with preferably B.Ed/ M.Ed with minimum 3 months certificate course in computer. Age Limit: Below 43 years. How to Apply: The applying person must be one, who has the flair and dedication to work in a Mission Mode situation. On the walk in interview day, the candidate will have to bring 2 copies of filled Application form and original mark sheets with photo copies. If necessary, a written test may also be conducted.